What was Evil Dead 4 going to be about? This is a mystery that many fans have been wondering for over twenty years. And while Ash Vs. Evil Dead will provide audiences with somewhat of an answer, it will be vastly different from the original movie plans. Speaking at NYCC 2015 in support of the new Starz series, director Sam Raimi finally explained what Evil Dead 4 would have been about, had it not gone down the episodic TV route. While Army Of Darkness was set up for a sequel, it had two very different, distinct endings. And depending on where you lived, or which DVD you bought, you may only be familiar with one of them. Fans have been wanting a follow-up ever since the movie debuted in 1993, but it was never really known which of these two ending would be continued once the further adventures of Ash were delivered. It isn't clear if Army of Darkness 2 will actually happen, but we'll be getting the Ash Vs. Evil Dead Starz series this Halloween. And the trailers already seemingly answer this question. While Ash Vs. 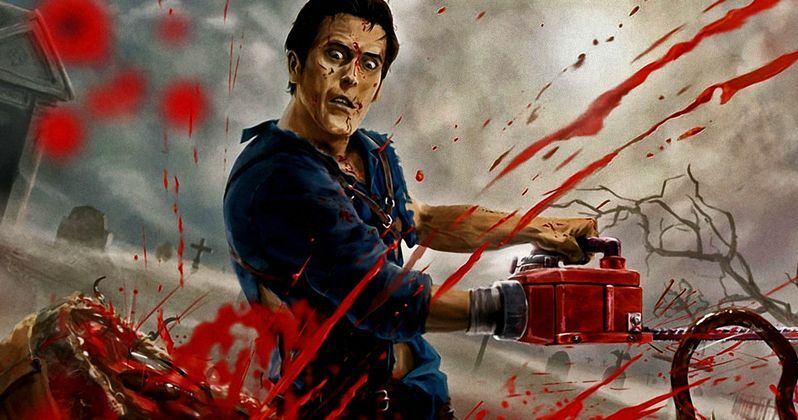 Evil Dead will surely contain some of the elements director Sam Raimi and star Bruce Campbell wanted to play with in Evil Dead 4, it will be vastly different from what they originally had envisioned. But even at that, plans for the franchise have done some strange twists and turns over the years. And at one point, a Freddy vs. Jason vs. Ash movie was seriously being considered. Which would have been fun, but could have tarnished the franchise legacy. As well, a company claiming to own the rights to the title Army Of Darkness decided they were going to make a sequel on their own. Thankfully that never happened. Instead of making Evil Dead 4 as originally conceived, Sam Raimi decided to produce a remake of the 1981 classic The Evil Dead, with Evil Dead arriving in theaters in 2013. The end credits teased the return of Bruce Campbell as Ashley Williams. And some figured Ash would show up in the remake sequel. It's still possible that could happen, with Ash teaming up with the remake's heroine Mia. Now that Ash Vs. Evil Dead is in the can and arriving in just a few short weeks, Sam Raimi has decided that he feels comfortable revealing exactly what would have happened in Evil Dead 4. Screen Crush moderated a Q&A at NYCC, where the director unveiled his scrapped plans. A fan asked about the various endings included on the DVD, and this is Screen Crush's account of Sam Raimi's response. "The story came in response to a question about the alternate (technically original) ending to /ash-vs-evil-dead-episode-titles-plots/Army of Darkness. Raimi initially planned to end the movie with Ash, who'd been tossed through time back to the Middle Ages, messing up his return trip to the present. A wizard provides him with a sleeping potion that will allow him to hibernate his way back to 1992. In the original ending, Ash messes up the dosage, sleeps too long, and wakes instead in a post-apocalyptic future. That ending played on the film internationally, but 'Army of Darkness' ' American distributor, Universal, hated the downbeat conclusion and demanded a happier alternative. Like Ash taking his potion, the new ending brings us back to the present. An audience member asked Raimi if they'd ever considered using the darker original ending from 'Army of Darkness' as the jumping-off point for the new show. He replied - and I am paraphrasing here - that before 'Ash vs. Evil Dead' fell into place, he and his brother Ivan were working on a script for a fourth 'Evil Dead' movie. And at that point, their bold plan was to actually make a movie starring two Ashes, one from each of 'Army of Darkness' ' endings. In other words, this 'Evil Dead 4' would have continued Ash's journey along both possible timelines in two parallel stories: Present Ash in one, future Ash in the other." That sounds crazy, right? Thankfully, we won't have to worry about 2 Ashs in Ash Vs. Evil Dead. But director/creator Sam Raimi wants to make it clear that this Starz series is the true continuation of the trilogy, and should be looked at as the true Evil Dead 4. The original Evil Dead 4 story idea was scrapped because the writers felt the story was too confusing and convoluted. Now, they have decided to stay true to the original U.S. theatrical ending, with Ash in present day. What do you think? Do you love or hate the idea of 2 Ashs?